Written for the Amstrad CPC by Martin Pedersen. Written for the Commodore 64 by Søren Grønbech. C64 full screen picture by Joost Honig. C64 hi-res scroll-routine by Thomas Larsen. In-game sounds by Ben Daglish of WE M.U.S.I.C. C64 loading tune by Johannes Bjerregaard. Here's my second piece originally written for the RESET magazine, with slight adjustments to suit the blog format better. Since there aren't all that many particularly interesting games that can be found only on two machines (for making shorter comparison articles), I had to take on a bit of a rarity this time. 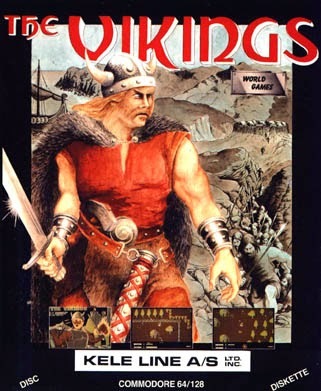 The origins of Kele Line's The Vikings are rather unknown, as this advert found at World of Spectrum should point out. Although various sources seem to think the C64 version was released in 1987, and the Amstrad version in 1986, both the games have 1986 as the year of copyright, and the clear date of release in each case is unclear. The game was never released on the Spectrum for whatever reason, although it was to be released through Status Software somewhere along the line with the Amstrad version, after the C64 version had already been released. At the time of release, The Vikings wasn't all that well received, because it was thought of as an outdated copy of Rambo: First Blood Part II, and truthfully, it isn't all too well thought of even currently, but the time has been kinder towards this game than many other games of the genre of the time. At Lemon64, The Vikings has been rated 6.9 with 20 votes, and at CPC Game Reviews, it has gotten a meagre 5 out of 10. So, you can perhaps imagine why I thought this would work quite nicely for my second entry on the very much C64-oriented RESET magazine. The Vikings is a multi-directional shoot'em-up adventure, in which you need to get from one island to another, kill hordes of enemy vikings and finally, plunder the castle on the northern Death Island while taking care of more lethal opponents. The game plays almost identically to the previously mentioned Rambo, but has some more elements to it, and plays in one long sequence, which is only separated by a boat ride from one island to another. What makes this game so different from Rambo are the elements of adventure, which in turn give this a more Gauntletian feel, if not even slightly Zeldaish. And I do mean, ever so slightly. First, you need to find a spear and a shield, so you can fight off the enemies. Then, you need to build a boat, parts of which can be found inside huts, which you need to burn in order to get your hands on the said parts. Of course, for this, you will need a torch. As you make your way to the second island, you will need to collect some gold pieces or treasure chests, depending on the version, and get through a maze and I know not what else, but apparently your final destination is some sort of a room inside the castle. You can watch a (cheated) walkthrough of the C64 version here, if you want to. So, what can I possibly say that hasn't already been said about this game plently of times enough? I suppose nothing, really. Unfortunately, it is what it is - a bland copy of Rambo with nice intro bits and a very nice soundtrack. It can keep you occupied for quite a while, and gives a bit more challenge than you would expect at first. In fact, when compared to Rambo, it seems practically impossible. If you enjoy games of this genre, it's a good alternative, and perhaps for the sake of the soundtrack alone, should be given some more publicity. Although games for machines like C64, Spectrum and Amstrad seemed to be available in at least two different formats by default - cassette tapes and floppy discs, our loading times comparisons will concentrate on the tape releases, because a tape drive is what most of us were only able to afford back in the 80's. Of course, this serves no purpose in reality, particularly now with emulation and so many new methods of loading games, but back then, loading times had some credit in the consideration process of buying a computer. There have been more purposeful loading times comparisons in the short history of my blog, but this one is here primarily for the sake of keeping up the tradition - or what's left of it, at least. The really notable differences between the two tape versions are the loading pauses and the separate intro bit on the C64, which you will need to manually get through by pressing the Space bar every now and then, which the Amstrad version lacks completely. It makes up for the missing mid-loader intro by taking more time to load up, though. weapons, so you will need to find a throwable sword first, making it instantly more difficult in comparison. The only other weapon you will find is a spear, which, unlike the sword, can kill many enemies in a single throw. Differences in the gameplay elements of the two versions are few, but all of them are of great importance. In the C64 version, shields are scattered around the first island, which will help you to survive longer. They are not present in the Amstrad version, which makes your need for zig-zagging around more important. Then again, the Amstrad version gives you shield behind bushes and rocks, which the C64 version doesn't. Burning down the huts is done in the exact same way in both versions. First, you need to have a torch, obviously. In order to burn down a hut, you need to first stand in an exact spot in front (below) the hut, which is exactly in front of the door - just slightly to the left of center, facing the doorway. Then, push the fire button first, and then move downwards while keeping the fire button down. It's a bit tricky, but that's how it works. When you manage to make it burn, each version handles the burning period differently. On the Amstrad, while the hut gradually disappears, enemies move around and shoot on like they normally do, and you can shoot downwards, and before you can move from the spot, you will not take any damage, which is nice. On the C64, the hut will just burst into flames, and for the duration of a brief burning animation, nothing else moves, which is better, because you can think your next moves with more care. The next clear gameplay difference comes along when you have finished collecting the pieces for your boat and set off for the second island. On the C64, you can navigate the boat by yourself, while the Amstrad version automatically takes you where you need to go. While this has very little meaning in the whole, it still feels like the game mocks at you, as if you are thought of not being able to handle the boating bit yourself. I haven't been able to get much farther than opening the stone gate to gain access to the second island, since most of my lives usually have been already taken by the time I get to the boating sequence, but as far as I can tell, it's basically all the same stuff from there on with slightly different graphics. As for the playability itself... well, the biggest problem with the Amstrad version is the horrible scrolling, which is character-based, and everything moves choppily, making it hard to dodge the enemy spears. On the C64, dodging the spears feels like child's play in comparison, because you always have a clear view of what's going on and the game scrolls quickly and smoothly. It still is very difficult, but at least you have a better chance of survival, particularly when you have the occasional help from the shields that last for a limited time. Also, the Amstrad version has a really irritating bug, which can make holes in the huts from yours and enemy spears in such a way that you cannot burn them anymore, unless you wander off the area for a bit and come back. Of course, this will most likely kill you at least once while you're at it. I'm not sure if anyone has made a bugfix for it, but that is how the original version plays, at least. So, I think the results for this section are quite clear. Although the screenshots might speak for themselves, once you consider all that has been said in the section above, let's take a quick run-through of everything necessary. Mid-loading credits & loading pictures sequence from the Commodore 64 version. First of all, the intro and title screens. On the C64, you get a full credit sequence before the actual main program is loaded. This sequence features text in a fancy font, along with two pictures: a full screen picture by Joost Honig, modeled from the cover art (blocky and ugly, but full screen!) and a much more traditional loading screen type of a picture, which unfortunately doesn't hang around for the rest of the loading. Loading screen and title/menu screen from the Amstrad CPC version. The Amstrad version only has a similar loading screen shown while it loads up, but it has no background, only the viking at the front, and although he looks a bit different, at least it's clearly more hi-res graphics. After the game has loaded in, the Amstrad version only gives you a very basic menu screen with the control options and the game title that looks like it was made by an 8-year old on a C64 with PRINT commands. Okay, the whole logo-and-text bit have been animated to scroll colours, but with the constantly orange background that will continue throughout the game. All of this makes the C64 version look almost like a completely different game, at least up to this point, since you get a properly pixeled title logo, a scroller text at the bottom and a funny (albeit a ragingly childish one) animation bit in the middle of the screen, the storyline of which I will not spoil here too much. In addition to all that, after the animation has finished, you get a detailed visual description of all the elements in the game, which you will need to concentrate on, with a text scroller and a map of the two islands, and finally, after the high scores table (with funky borders), a very brief demonstration of the islands is shown, as they appear in the game itself. In-game screenshots from the Commodore 64 version. Funnily enough, the in-game graphics have less material of importance to talk about. The colour scheme on the C64 is predictably brown, with some blue, light blue, black, grey, red, green, turqoise, orange, yellow and white in just the right places. Apart from the colours, the game has been made to look almost like an NES game with its tile-based placing of items. Although it was pretty much the same thing in Rambo, the ground pattern was made to look in a way it made the other graphics look more natural in the environment. All the animation is cheap, but functional, and everything works well enough because of the good scrolling. In-game screenshots from the Amstrad CPC version. This isn't the case with the Amstrad version. Because the scrolling is so bad, and the background, or if you prefer, ground colour is orange, it only makes the garishness of the graphics more pronounced. 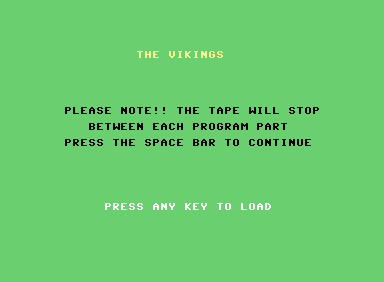 At least all the viking sprites look more personalised than on the C64, but everything else looks pretty much the same as they do on the C64. There are a bit less colours, though - you get blue, light blue, white, grey, black, green, red, yellow and black, which means it's missing brown and turqoise. And one could make an argument that the bug where you and the enemies can shoot some pieces of a hut off, making them unburnable until you make your way out of the screen with the said hut and come back where the hut is now complete again, could be considered a graphic bug, but I honestly have no idea where the problem is. But considering everything, I think the results are quite as clear in this section, as they were in the previous. This is by far the easiest section to compare this time, because neither version has anything to offer than music. The looping in-game music is made by Ben Daglish for both versions. The C64 version not only another tune in the mid-loader intro bit by Johannes Bjerregaard, but also a game over tune, a high score list tune and a couple of rarely used sound effects and some other tune which I can't really place where it belongs, but it's all included in the sid-file, which you can easily find from the internet. For the sheer difference in the amount of tunes alone, the C64 would win, but for the fun of telling you why the C64 version of the in-game tune sounds better, let's have a go at it. The sounds used in the Amstrad version of the Daglish tune are incredibly flat and have very little feel of life at all. You do get the obligatory snare drum and one variation for it, a bass track and a melody track, but it all feels so undramatic it almost hurts. There is one little tricky bit in the middle of the tune, but even that sounds a bit sad in comparison to the C64 version, which has a very varied and imaginative use of sound types. There, you get your trademark arpeggio sweeps, filter effects and nice dynamics every now and then, so it definitely has more to offer than the Amstrad tune, thus gets boring less quickly. When you get into more theoretic detail, the Amstrad tune is played half a step above the C64 tune (G minor and F# minor), but that really has very little importance on the whole. The one thing that the Amstrad version has sort of better is the option to turn off the music, if you get bored of it, but then you have no sounds at all. So again, we have a very clear case here. For a change, writing a comparison felt more like an ice hockey match or a similar event, where the other team has such a clear advantage in one way or another, that it seemed futile to even see it through. But there it is, a win for the C64 team, as it was supposed to be. 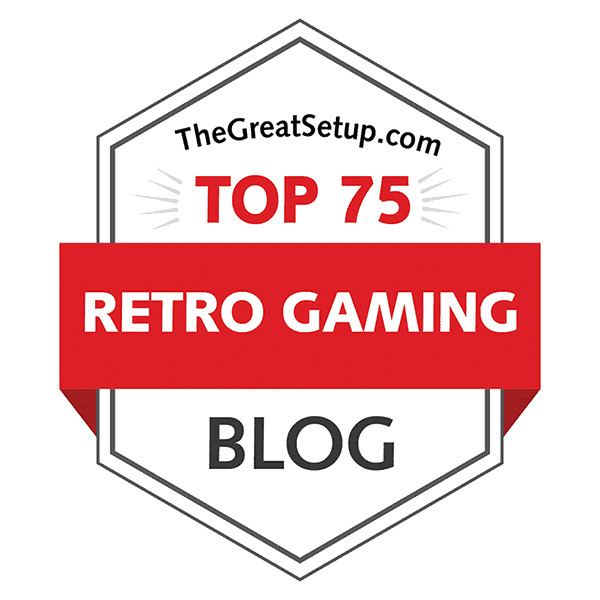 Actually, re-reading the review at CPC Game Reviews now after this is finished, I would even go so far as to call the 5 out of 10 rating slightly too generous. To be fair, it's not completely horrible, because I managed to get on the second island without a trainer, but it does play, look and sound a fair bit worse than its competitor. Screenshots from an advertisement demo on the Commodore 64. Perhaps, for the sake of balance, I will write something less C64-centric next time for RESET. In fact, I already have an idea for the next article, but I will not spoil the surprise. What I actually would like to know is: are there any games on the Amstrad, that could seriously be considered an easy win against its two main competitors? Give me some suggestions below, or any other comments if you feel like doing so.